Our White Tree Diamond Button is made in fine pewter. It measures 1 inch by 3/4 of an inch and is diamond shaped. 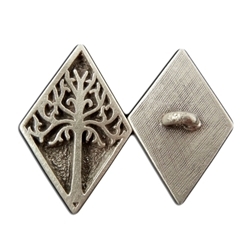 Our White Tree Diamond Button is made from lead free pewter in the USA. It would be great for any sewing, knitting, or costuming project. It has a shank on the back of the button to securely attach it to your garment by sewing it on.